Fluctuating commodity prices place productivity at the core of growth strategies in the mining sector. As mines mature, it becomes more important than ever to have a clear, comprehensive view of extraction grades, machinery functionality and overall productivity. Knowing how the mine is performing at all times so as to make well-informed mining, financial, marketing and maintenance decisions is crucial. Often, the piecing together of a digitisation strategy is not the stumbling block for businesses. Rather, it is minimising business risk in the digitisation process – disruption to current operations, cost, time and, in a rapidly changing technology landscape, ensuring longevity of the solution. Often selected as the technology partners for digitisation, we enable the monitoring of all mining processes across the whole mine. This offers clients a platform of standards to bring all critical components within the operation into a single, interactive, real-time operational matrix, facilitating easier operational efficiency supported by cross-platform application, device, sensor, machine and human integration. 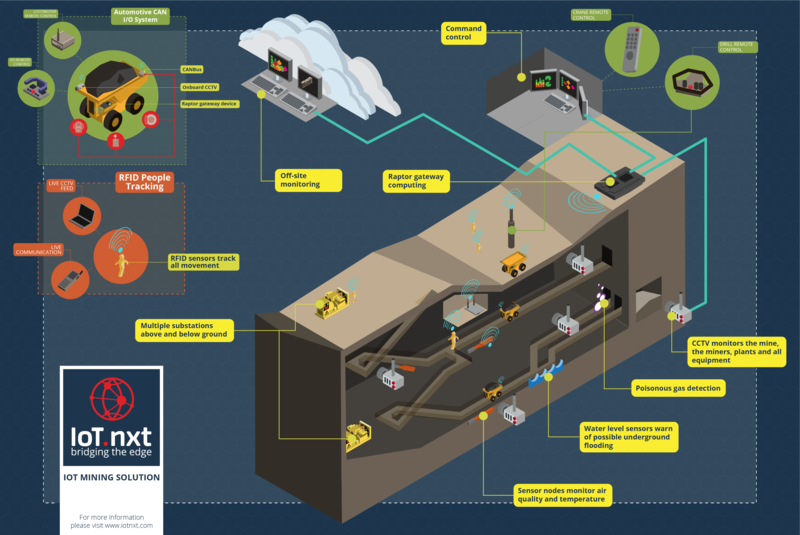 Using our Internet of Things platform, we are able to assist in bringing about the change required to ensure that mines are able to actively monitor and action any changes in operation, and deploy solutions in real time.